Passion, sincerity, and a genuine concern for others — these are the key traits a hiring manager looks for in a caregiver. Our sample caregiver cover letter and expert writing tips will give you a helping hand in highlighting these aspects and making the best first impression possible. On the other hand, if taking care of others has you pressed for time, use our professional cover letter builder to get yours done in minutes! I’m thrilled to be applying for the open Caregiver position at [Target Company], as advertised on indeed.com. 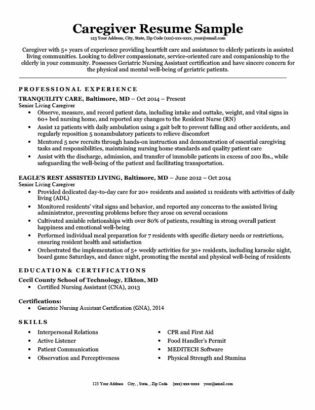 I am a certified Geriatric Nursing Assistant (GNA) and have thoroughly enjoyed working to assist geriatric patients for the past 5 years. I strongly believe that my passion and sincere desire to help the elderly makes me the perfect candidate for the job. I have always taken the “giver” in “caregiver” very seriously and as such have devoted myself to the selfless care of all my clients. I take an approach that focuses on dedicating myself to ensuring not only the health of patients, but also their happiness. Towards this end, I spearheaded the development of 5 weekly activities for over 30 residents, ensuring that their time in my previous community was as enjoyable as possible. I noticed on your website that your community has a large number of patients who are not ambulatory. At my previous job, it was my pleasure to regularly reposition 5 immobile patients in order to prevent physical discomfort. I would love to be able to utilize my physical strength (combined with a gentle touch) to provide the same much needed assistance to the members of [Target Company’s] community. I’d be thrilled for the opportunity to come in for an interview and hopefully even get to meet some of lovely people living in your community. I can be available any day of the week if given advanced notice. Thank you for your time and consideration. If you’re serious about getting hired, you should put as much love and care into your cover letter as you would with your clients. This guide will give you all the knowledge and tools necessary to accomplish this task with flying colors. Depending on the type of institution or clients you will be working for, you may need certain certifications to get the job. Mention these necessary certifications as soon as possible. If a hiring manager doesn’t see the certification they’re looking for within the first paragraph, it’s likely they will stop reading your cover letter and move on to the next applicant. Don’t let this happen! 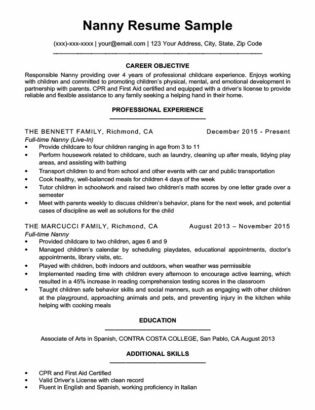 On the other hand, if you’re trying to write a cover letter for a caregiver with no experience — don’t panic. Many caregiving jobs don’t require any certifications and will give you on-the-job training. All you have to do is express your sincere desire to help others. As for how to do that, our next tip has you covered. If you’re a caregiver with no experience, your first introductory sentence should include an experience, skill, or personal trait you possess that is transferable to caregiving. Company’s or clients looking for caregivers want more than just a highly qualified individual. Taking care of others is a tough job, so hiring managers want to know you have the enthusiasm required to give your all. Your cover letter gives you the opportunity to express the passion for helping others that is sometimes difficult to fully convey on your resume — take advantage of it. 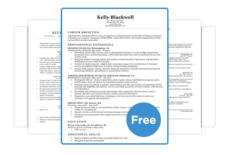 If you’re still having trouble finding the right words to show how much you love caring for others, our resume adjectives list and guide is a great resource at your disposal. When writing a caregiver cover letter, doing some research on your target company (or client) is essential. You can’t expect someone to hire you if you don’t know what kind of clients they have. Find out the special needs of the patients at your target company and tell them what you can do to help. Highlighted in orange the candidate mentions the points discovered from their research. In green are the skills they possess that can help this particular living community’s patients. Do research and find a need that you can fulfill with your experience, knowledge, or skillset. Check your target company’s website, do a google search, or even just take a hard look at the job description and find a need that you can fulfill with your experience, knowledge, or skillset. Letting your target company know exactly how you can be of benefit to them goes a long way in convincing the hiring manager to bring you in for an interview. Now that you have everything you need to write the perfect caregiver cover letter, you may want to give a helping hand to your caregiver resume too! Or, if you’re still worried your letter might not be up to scratch, let our professional cover letter builder take care of it for you!